The Short Haul Pointscore is a non-spinnaker series comprising of 13 races. Several are raced in the Harbour and at night. The majority of races are sailed off Sydney Heads. A Spring Pointscore and an Autumn Pointscore will also be conducted. The Spring Pointscore will comprise all races held prior to Christmas (8 races with the best 7 to count). The Autumn Pointscore will comprise all races held after Christmas (5 races with the best 4 to count). 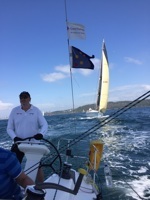 The passage pointscore will comprise the Pittwater races and the Botany Bay Race (5 races with the best 4 to count). Competitors competing in the Ocean Pointscore require a Special Regulations Audit of Category 4. Note the Night Harbour Races are Category 5.